South Africa's healthcare system is enduring the most comprehensive audit ever conducted as local and international experts gear up to mine the unprecedented mountain of data for criteria to identify 10 of the country's 52 health districts to pilot national health insurance (NHI) delivery from April next year. Izindaba spoke to four key players in this multi-faceted NHI preparation: National Health Director-General, Malebona Precious Matsoso, her deputy, Dr Yogan Pillay, Office of Standards Compliance chief, Dr Carol Marshall, and Ronelle Visser, a director at the Health Systems Trust (HST), the lead NGO in a consortium contracted to conduct the historic baseline audit of the 4 200 health facilities and their 52 districts. With the external baseline audit 62% complete by November (with nearly 20% of facilities 'validated' to ensure high-integrity data), top local health economists have already met with departmental officials (17 September) to profile districts according to demographics, socio-economic and service delivery indicators, health systems performance and expenditure reviews. Matsoso said the next step would be to match the outcome of the newly completed facility audits to district management audits, 'because performance is informed by the supervision of a district'. 'We'll match results of that with the capacity of each district - that will be key in determining how we're going to pilot ... we have to strengthen the districts,' she added. Both she and Pillay scotched rumours that the 10 pilot districts had already been identified or that there would be one pilot district per province, plus a single metropole. Speaking from France where he was attending an international TB conference, Pillay said to describe the 10 districts as 'pilots' would be wrong; 'it's more like proof of concept and implementation - there's no way we've chosen them yet, there's too much data to come in. You have to pick districts where the NHI has a good chance of succeeding ... and that depends on the criteria you set up and the outcomes you're looking for.' 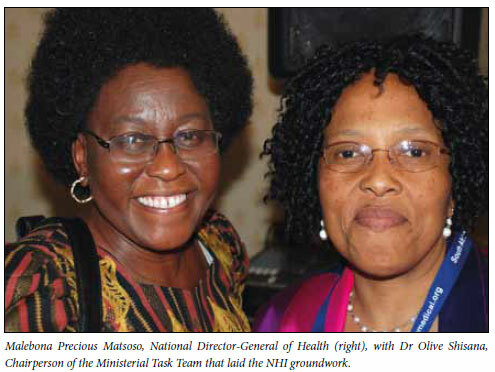 Matsoso confirmed that NHI piloting would begin in April, running through to September next year, after a national consultative forum of all stakeholders convened at the end of November (2011) to discuss and debate piloting criteria and to study a geographical information system mapping every facility (public and private) countrywide. The consultative net would be thrown wider this December, drawing in 'about a dozen' veterans from countries that had initiated an NHS, including Brazil, Mexico, Costa Rica, South Korea, Thailand, the UK, the Netherlands and Germany. These experts would brainstorm the existing local dataset with 'all our top experts and stakeholders' to identify the most feasible 10 pilot districts. 'We can't just do underserved areas because of the practical difficulties [National Health Minister Dr Aaron Motsoaledi earlier said these would be prioritised for support]. We need to get a sense of best practice so we can compare. It goes way beyond quality; we're talking management, governance, finances, administration, human resource strategies, head counts, norms and standards for each hospital and clinic,' Matsoso explained. The projects running concurrently include one in which 20 inspectors from Dr Carol Marshall's Office of Healthcare Standards Compliance (OHSC) are undergoing intensive training in the UK and locally to prepare them for external inspections of the 4 200 facilities this January. These inspections will reveal if, or by how much, facilities have improved since their baseline audit. Also, 36 technicians are undergoing clinical equipment training at the Tshwane University of Technology. Marshall said that although the first round of OHSC inspections would not have the 'force of law' (the relevant National Health Amendment Bill making the OHSC a statutory regulatory body was only expected to be certified by the State law advisors in November with enactment probably at best in February), they would prove hugely instructive and informative. One of the biggest criticisms of the public health system, both internally by clinicians and externally by analysts, is dysfunctional or non-existent maintenance and repair systems.1 Matsoso said every health facility should 'at least have people who can fix things... they used to have workshops of their own but now it's mainly being contracted out to the private sector (who routinely withdraw services due to non-payment).2 The three dozen technicians would gain appropriate clinical skills to enable fast repair of vital equipment like CAT scanners and X-ray machines 'so that this equipment doesn't stand idle for months on end,' added Matsoso. Pillay told Izindaba that tertiary hospitals would in future be managed by somebody at the official level of Deputy Director- General, while the reigns of central hospitals would be taken up by 'someone at level 12' (i.e. the same official level as a senior deputy director). All hospital CEOs would be obliged to have a health background, though not necessarily be a medical doctor. 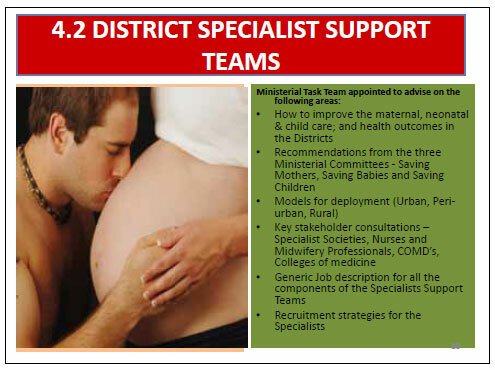 The R500 million start-up or pilot phase of the NHI will include the district-based clinical specialist support teams, school-based primary health care services and family health teams and general practitioner services. (The European Union has pledged R1.2 billion over three years to strengthen NGO participation on primary healthcare, capacity building and primary healthcare re-engineering.) 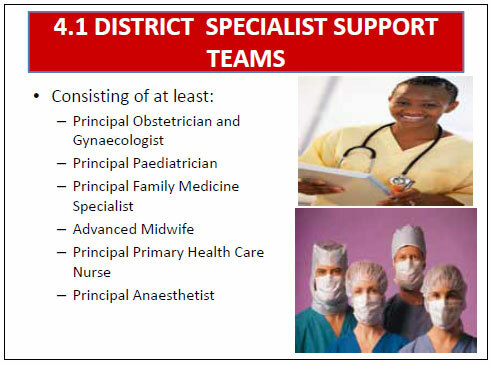 A technical advisor on the NHI to the health department, Dr Acquina Thulare, told Izindaba that the staffing of the first 10 pilot specialist support teams was being secured via discussions with relevant specialist societies, faculties of health science and Colleges of Medicine, all of whom had pledged their support. 'We realise that you can't just get 52 obstetricians in one go, so we have to make sure that the pilots are adequately capacitated. Positions will be advertised at principal specialist level and we'll also be looking at retirees (past 65 years old) and foreign doctors,' she said. HST chief Ronelle Visser told Izindaba that the ambitious baseline audit began as a pilot in the Northern Cape on 3 May, with the Western Cape being the last province to join the process on 20 July 2011. 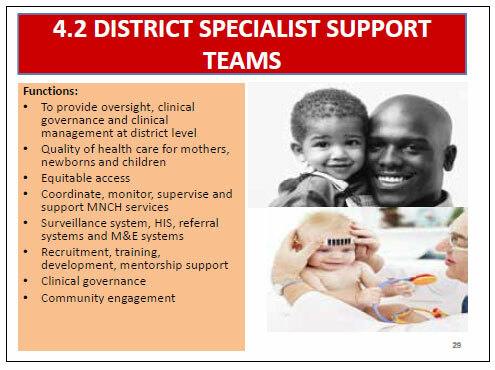 Speaking towards the end of October, she said her team of 160 people had validated nine districts after baseline audits kicked off with ministerial priorities, such as availability of medicines, cleanliness, patient safety, infection control, staff attitudes and patient waiting times. 'But the baseline also encompasses infrastructure, medical technology, facility profiles, HR, maintenance, grounds, security, asset management plus the profiling of basics like water, sanitation, reticulation, drainage, ash removal and medical waste. We briefed MinMEC (the collective of National Health Minister Motsoaledi and his nine provincial counterparts) on 17 September on our progress and preliminary findings.' 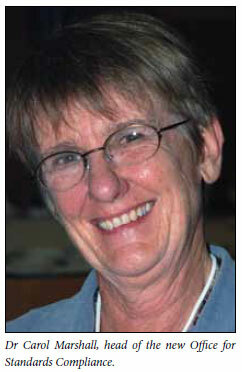 Visser declined to elaborate, saying it would be unprofessional to discuss findings. However, she hinted that a review of the controversial issues consistently ventilated in the media would prove instructive (read management incompetency, woeful infrastructure and dire human resources). 'There are pockets where it's really bad, but the bottom line is that most of the things we're finding are easy to fix and not that resource intensive. It may not look good on audit but it's relatively easy to fix.' Partners in the baseline audit consortium include Arup (built environment engineers analysing infrastructural data), Exponant (architectural experts on the built environment) - both private companies - and the Health Information Systems Programme (HISP), an NGO specialising in field work and data base management, plus the Medical Research Council, which is providing technical specialists for analysis around health economics and human resources.